The productivity indicators are based either on the microeconomic or the macroeconomic notion of sectors of production and vertically integrated sectors of production correspondingly. The first refers to the set of factors of production implemented by the enterprise, whereas the others are the utilized factors employed in other sectors added to the microeconomic sectors. In a traditional approach the microeconomic sectors of production play a dominant role in the analysis of economic development. This paper suggests a microeconomic approach of macroeconomic production factors with the realism implied by using the Computable General Equilibrium (CGE) Models, while enhances the study of areas which are difficultly examined by the aggregate production function. 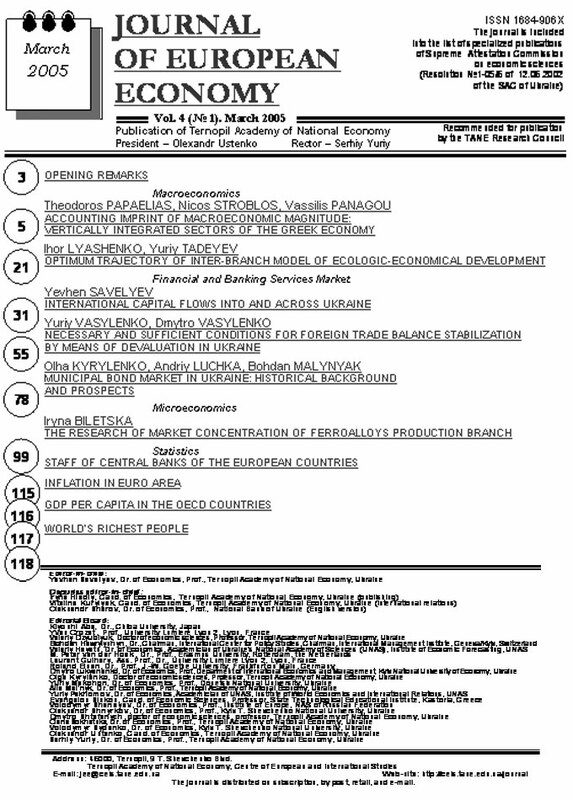 The proposed methodological tool is applied to the Greek economy. Microeconomic and macroeconomic production functions, capital, labor, closed economy, a final or intermediate commodity, vertically integrated sectors, aggregate production function, economic growth. 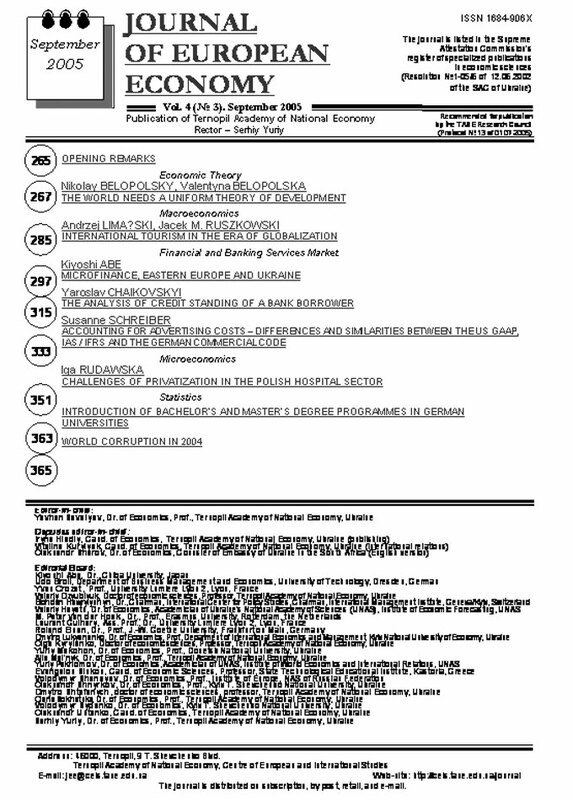 This paper analyses a question of expansion of classic dynamic interbranch model in case of the ecological-economic system. There is main trajectory of the balanced development of Neyman built for the offered dynamic interbranch ecological-economic model. Ecological-economic system, inter-branch ecological-economic model, dynamic equilibrium, main trajectory, maximal rate of the economic growth, the Neyman ray. 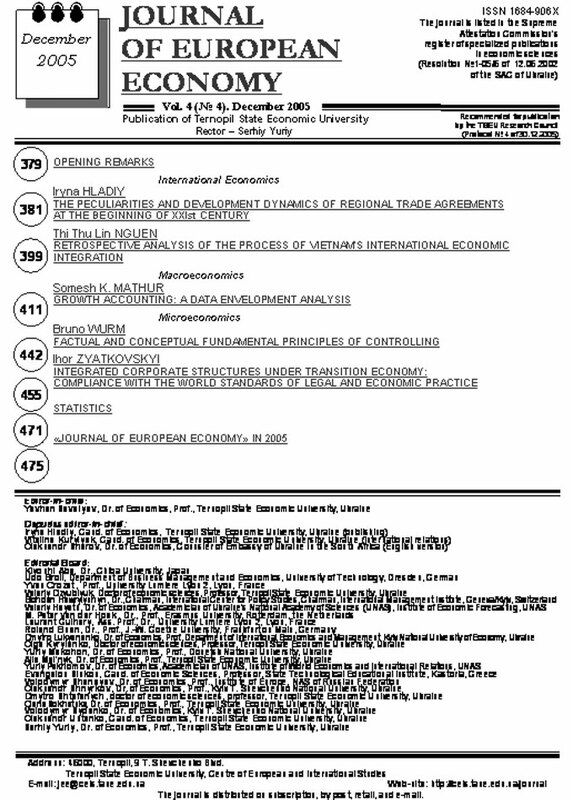 The paper reviews on theoretical basis international capital flow movements. It proposes few new trends that exist in the capital markets, the waychanges are taking place in Ukrainian financial market and its further integration in the world market. The paper proposes few ways in which, a financial offshore center can be created in Ukraine. It also discusses the advantages of having a financial offshore center in Ukraine at both political and economic levels. International capital flow, foreign direct investment, portfolio foreign investment, international lending, international financial centers, offshore areas, internationalization of bank concentration of capital, internationalization of capital allocation. 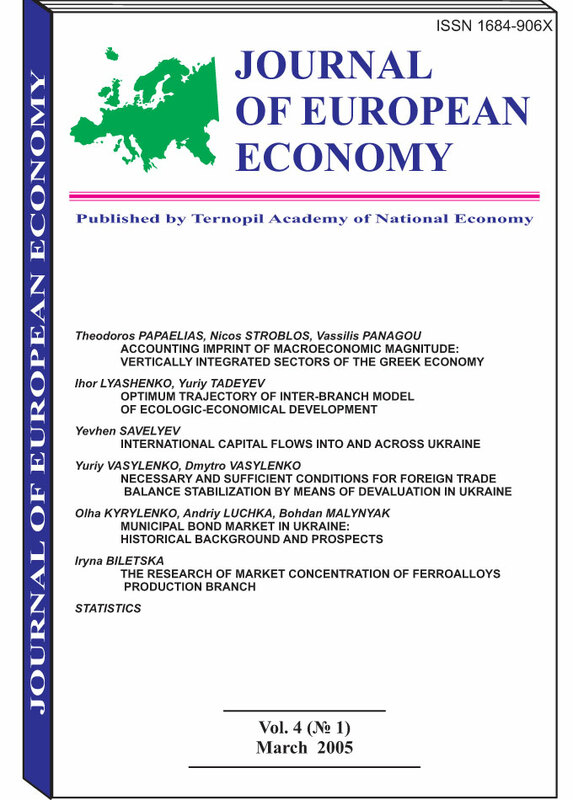 This paper defines necessary and sufficient conditions of trade balance stabilization in Ukraine that, contrary to well-known Marshall-Lerner and Bickerdike-Robinson-Metzler conditions, is applicable to non-zero trade balance and to any elasticity of export and import. It also presents and analyses quantitative estimations of changes of physical volumes, prices and values of export and import after some devaluation. For practical purposes the authors received the diapasons of elasticity of exports and imports, in which devaluation makes negative trade balance positive or zero. Trade balance stabilization, devaluation, necessary and sufficient conditions. The paper reviews the historical background and the development of the local loans markets in Ukraine. The paper examines the municipal loans markets in other EU and Asian countries. The paper also examines the current issues of the development of the local loans market in Ukraine. The paper ends with certain suggestion for improvement in the national system for allocation of local budgets. Local (domestic) loans, home debt, securities, project borrowings, loans to redeem the temporary cash gaps, municipal securities market, restricting norms, rating agency, default, debt refinancing, emergency budget. This paper determines a level of a market power and competitive structure of the world market of ferroalloys. The firms that are forming «core» of the market are identified and their role in a global competition of ferroalloy manufacturers is determined. The cconcentration index; Lind’s Index; Herfindal-Hirshman Index; the entropy index; the logarithm dispersion of the market shares ratio; Ginni Index; Lorenz Curve. The author elaborates the criteria which may be applied in a number of economic policy areas that are in the spotlight international policy debate. This paper studies the cyclic patterns in transition economies with multivariate spectral analysis. It examines whether the transition in Slovenia and Croatia was marked by a significant shift in aggregate economic activity, which corresponds to the definition of the business cycle, and whether the cycles are synchronized with the cycle of the EU. For Slovenia, we find very close synchronization. The testing for Croatia, however, suggests that there is no typical EU component in its business cycle. To additionally support the results obtained with multivariate spectral analysis, we also employed the Granger causality test. According to lag selection criteria, economic activity in Slovenia lags behind the EU economic activity for 1 month. Granger causality test also supports the results for Croatia. We could not find any significant connection between economic activity in Croatia and the EU. Business cycle, multivariate spectral analysis, Granger causality synchronization. The paper reviews the aspects of setting goals, formulating values and determining the sense of banking from the viewpoint of cultural peculiarities of the countries where banks are functioning, to make cross-cultural dialogue, and to overcome the contradictions of globalization. 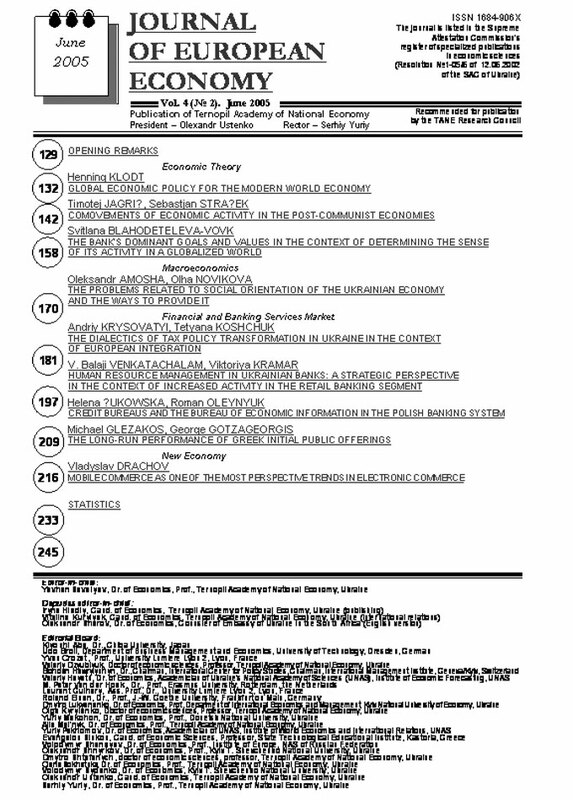 Bank’s goals, globalization, bank’s values, strategy of the banking institution. 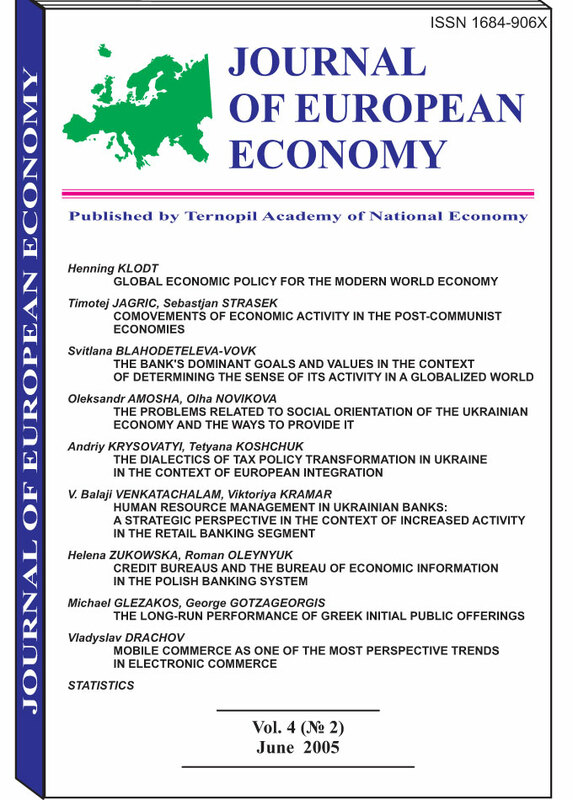 This paper estimates the situation and trends in the social sphere of Ukraine. The authors analyze the legal support to the social policy and substantiate the directions for providing the social orientation of the economy. Social sphere, social policy, social orientation of economy, social interests, social labour relations, labour market, employment, unemployment, social protection. 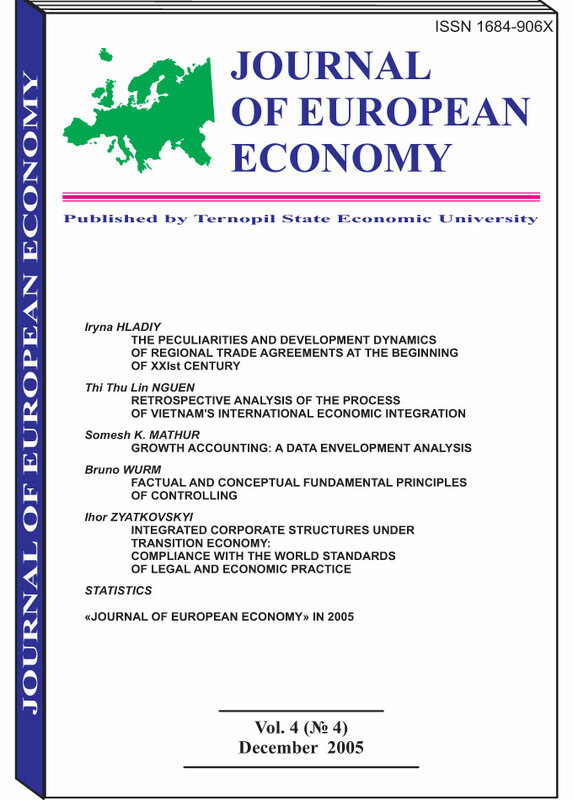 The article substantiates theoretical principles of optimal tax infrastructure for ensuring economic growth in Ukraine within the framework of EU integration. Having analyzed the European experience of tax regulations and national practice of tax policy formation and realization, the authors determine strategic goals and tactical measures for tax transformation. Tax, tax policy, tax infrastructure, tax regulation, tax unification, direct and indirect taxation, tax preferences, economic and institutional basis of tax transformation. Banking is a heavily capitalized sector whose investments consist essentially of employees to such an extent that the transformation required can only be affected over time. Strategically, if Ukrainian banks are to be successful, in the near future they will have to redefine the principles of Human Resource Management (HRM) and make it of top priorities. HRM practices are most effective when matched with the strategies of organization. By adapting highperformance workplace practices, banks in Ukraine can create capabilities that will add value to their operations. Ukrainian banking sector, Human Resource Management, strategic HRM, retail banking. Unfairness in business is a common feature known around the world, but in the countries with the developed economy there are quite effective mechanisms and institutions that hedge (limit) dishonesty in economic relations. In the economic systems that are just developing, to which one can refer the new members of the European Union and Ukraine, many good companies bear huge losses because of the unfair partners and debtors with bad reputation. This article will try to reveal the experience of fighting with this feature in the Polish economy. Credit bureau, Bureau of credit information, credit risk, client with bad reputation, Bureau of economic information, client database.